This week Robert D. Skeels was interviewed by La Opinion about Mayor Villaraigosa's Partnership for Los Angeles Schools (PLAS). “PLAS has completely ignored our communities,” says Skeels. 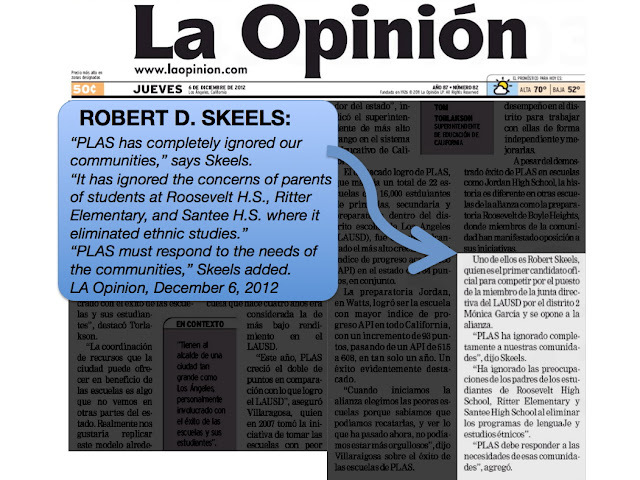 “It has ignored the concerns of parents of students at Roosevelt H.S., Ritter Elementary, and Santee H.S. where it eliminated ethnic studies.” “PLAS must respond to the needs of the communities,” Skeels added.